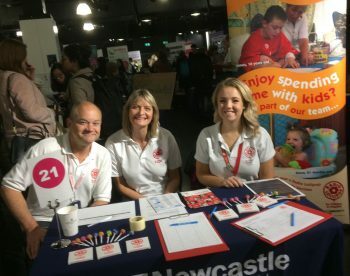 This week Radio Lollipop Newcastle volunteers Andrea, Ann, Guy and Morgan attended the Newcastle University Freshers Welcome Event and had a great response. We were made to feel very welcome by the University and we look forward to welcoming some new faces to the Great North Children's Hospital in the coming weeks. If you want to have some serious fun then apply to be a Radio Lollipop Volunteer. More information about the requirements can be found under the "Tell Me More" link on the Radio Lollipop website. When you're ready, complete the simple "Contact" form on the Radio Lollipop website.